Enterprise IT infrastructure requirements continue to evolve as CIOs and CTOs seek ways to support their agile DevOps methodologies. Meanwhile, IT vendors are attempting to remove complexity from the typical provisioning and deployment process via automation. 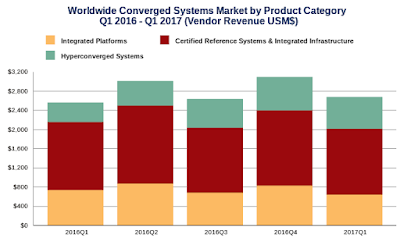 The worldwide converged systems market revenues increased 4.6 percent year-over-year to $2.67 billion during the first quarter of 2017 (1Q17), according to the latest global market study by International Data Corporation (IDC) . The market consumed 1.48 exabytes of new storage capacity during the quarter, which was up by 7.1 percent when compared to the same period in 2016. "Converged systems have become an important source of innovation and growth for the data center infrastructure market," said Eric Sheppard, research director at IDC. "These solutions represent a conduit for the key technologies driving much needed data center modernization and efficiencies such as flash, software-defined infrastructure and private cloud platforms." Integrated infrastructure and certified reference systems are pre-integrated, vendor-certified systems containing server hardware, disk storage systems, networking equipment, and basic element or systems management software. Hyperconverged systems collapse core storage and compute functionality into a single, highly virtualized solution. A key characteristic of hyperconverged systems that differentiate these solutions from other integrated systems is their scale-out architecture and their ability to provide all compute and storage functions through the same x86 server-based resources. During the first quarter of 2017, the combined integrated infrastructure and certified reference systems market generated revenues of $1.37 billion, which represented a year-over-year decrease of 3.3 percent and 51.3 percent of the total market. Dell Inc. was the largest supplier of this combined market segment with $647.8 million in sales, or 47.2 percent share of the market segment. Integrated Platform sales declined 13.3 percent year over year during the first quarter of 2017, generating $635.9 million worth of sales. This amounted to 23.8 percent of the total market revenue. Oracle was the top-ranked supplier of Integrated Platforms during the quarter, generating revenues of $348.7 million and capturing a 54.8 percent share of the market segment. 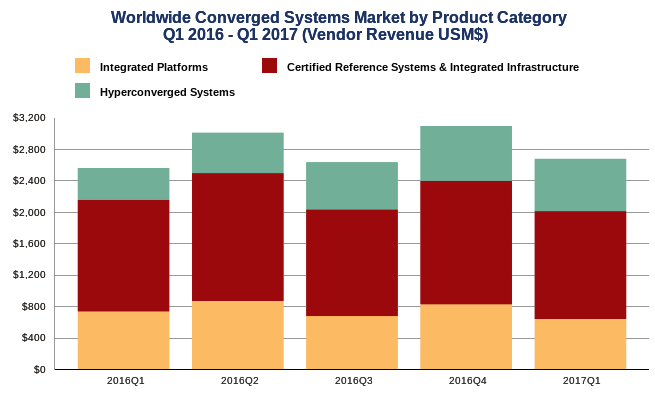 Hyperconverged sales grew 64.7 percent year-over-year during the first quarter of 2017, generating $665.1 million worth of sales. This amounted to 24.9 percent of the total market value.